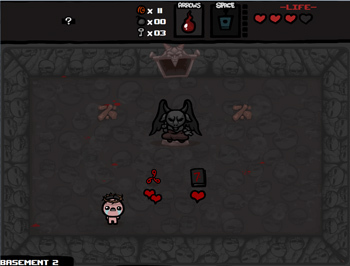 The Binding of Isaac: Rebirth features fancier graphics, new content and local co-op. Edmund McMillen has confirmed that his creepy, brilliant dungeon crawler, The Binding of Isaac, is heading to consoles in the form of The Binding of Isaac: Rebirth. The remade game is being published by Nicalis, the same studio/publisher responsible for the console ports of Cave Story, La-Mualana and VVVVV. It features revamped graphics, new content in the form of a second expansion and local co-op. While local co-op and actual gamepad support will be nice, I'm more excited to see the game running on something other than flash. Despite its simple visuals, Isaac played havoc with even the strongest PCs. Nicalis will be doing most of the heavy lifting when it comes to the port, with McMillen providing designs for the new enemies and environments. It'll also be handling all the paperwork, as one of McMillen's conditions for porting the game was that he won't have to "deal with anything when it came to business." "The whole game will be remade and rebalanced," McMillen wrote on Formspring back in August. "The remake will be more than just an expansion; it will be a new game with all new graphics, music, etc. It will also feature an expansion sized pack of all new content, bosses, characters enemies, items, etc. And yes, in about a year, if/when it comes out, the Flash version of the game will appear obsolete for sure... The goal is to also keep the cost of the remake as close to Isaac+wrath as possible as well." McMillen says he's looking to discount the game for those who already own the original Flash version, but it remains to be seen how, or even if, that'll be possible. There's no word on which consoles will eventually get the game, but unless there's been some major changes at Nintendo in the past six months, I reckon a Wii U/3DS release is still less than likely.